RUSH: President Trump talked about the issue. This was around 11:15, 11:30. We have three sound bites. CNN is already ripping President Trump because he did not mention guns at any time in his address to the nation. THE PRESIDENT: We are all joined together as one American family, and your suffering is our burden also. No child, no teacher should ever be in danger in an American school. No parent should ever have to fear for their sons and daughters when they kiss them good-bye in the morning. Each person who was stolen from us yesterday had a full life ahead of them, a life filled with wondrous beauty and unlimited potential and promise. Each one had dreams to pursue, love to give, and talents to share with the world. And each one had a family to whom they meant everything in the world. THE PRESIDENT: I want to speak now directly to America’s children, especially those who feel lost, alone, confused, or even scared. I want you to know that you are never alone, and you never will be. You have people who care about you, who love you, and who will do anything at all to protect you. If you need help, turn to a teacher, a family member, a local police officer, or a faith leader. Answer hate with love. Answer cruelty with kindness. THE PRESIDENT: We are committed to working with state and local leaders to help secure our schools and tackle the difficult issue of mental health. Later this month I will be meeting with the nation’s governors and attorney generals where making our schools and our children safer will be our top priority. It is not enough to simply take actions that make us feel like we are making a difference. We must actually make that difference. RUSH: That’s a pretty good comment. Trump’s gonna go down to the school. He’s gonna visit the school tomorrow or over the weekend, meeting with people there. 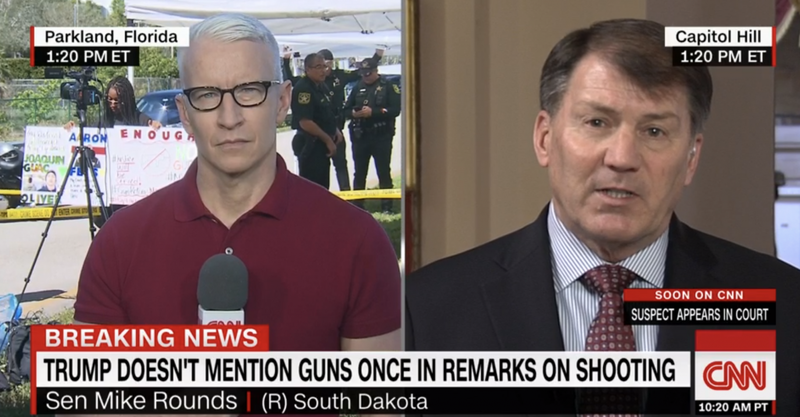 And CNN’s reaction to this, as I say, was to point out that Trump didn’t talk about guns. He didn’t mention guns once, which means what Trump said is worthless. ‘Cause Trump did not advance the leftist agenda with his bully pulpit speech here. So now, I turn to a piece from Newsweek. I thought this place had blown up and disbanded. I thought I read the other day where the owner of this place told everybody to find new work because the place is shutting down. Don’t need anything from you! “The student called on the president to ‘do something’ and take action on gun control, rather than simply offering prayers” and words that don’t mean anything. A lot of vitriol out there. A lot of anger and a lot of rage.